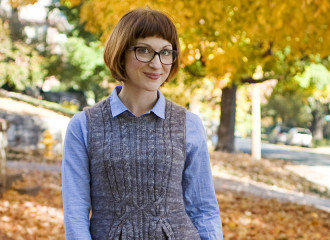 Carina Spencer is an independent knitwear designer and lifelong Midwesterner. Raised in Champaign, IL, she has called Kansas City, MO home for the past 15 years. She has published independently as well as in several issues of Knitscene and through collaborations with many of her favorite indie yarn brands. Carina is also a professionally trained personal chef, wife, and mother of two. Visit her on the web at CarinaSpencer.com. Email Carina at carina@carinaspencer.com.